The countries of West Asia and North Africa (WANA) have long had the challenge of providing sustainable livelihoods for their populations in the fragile ecosystems of semi-arid and arid areas. Climate change is already a reality in WANA and it places additional constraints on the already fragile ecosystems of dry areas and limited natural resources in WANA. Hence there is an urgency to develop, and strengthen further, research and technology transfer on adaptation, mitigation and production system resilience. A comprehensive and integrated approach to planning and implementing the climate change adaptation strategies across the wide range of agro-ecosystems in different countries in WANA could help both the planners and the local communities to deal effectively with the projected impacts and also contribute to overall sustainability of agricultural production systems. 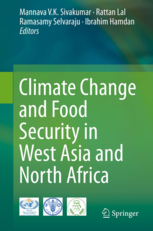 This book addresses the important issue of climate change and food security in West Asia and North Africa and presents perspectives from different sub-regions in WANA. The mitigation and adaptation options for different agroeconomic sectors in WANA as well as policy, financial, institutional and cooperation issues are discussed. These could help in the development of new policies to better adapt agriculture production systems and enhance food security in WANA.